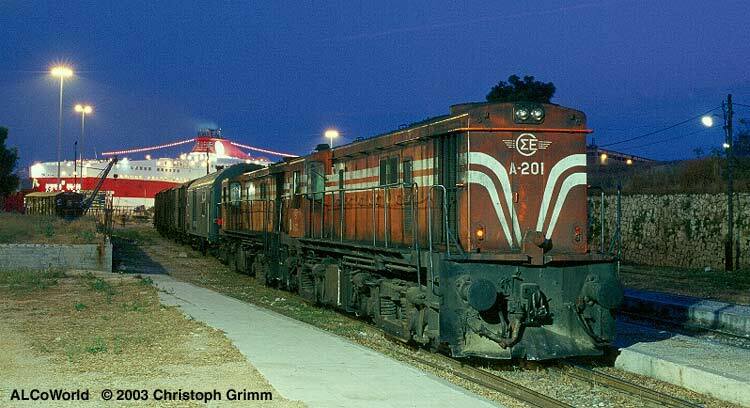 A-201 and 210 with an excluvsive special train at Pireas port, May 29th, 2003. The station is to be closed down in September 2003. The smallest of the ALCos ("Baby ALCos") in Greece are still alive and kicking. Their usual duties are hauling local freights and work trains and the occasional passenger train. Years ago they were to be found often on the overnight express-freights 23500/23501 between Athens and Thessaloniki. Seven units are still on the roster, three were wrecked (A-202, A-203 and A-207), the remains of A-203 are still stored in Thessaloniki (as of April 98). 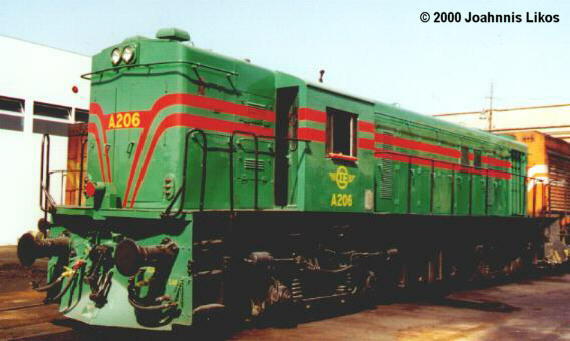 All units were originally painted in green with red stripes (see below), now all American locomotives in Greece are painted in orange with white stripes, except the "historic" units like A-206, A-302 and A-325. These are all in their original paint scheme again. March 99: Apparently about four of the "Baby Alcos" are still in use, the Strimon - Kulata line, and the border crossing loco from Idomeni - Gevgelija are both still regular duties. In December 2000 A-205 replaced a Ganz DMU on the Larissa - Volos line, another was seen at Plati working sugar beet freight. May 03: A-201, 204, 206, 208, 209 and 210 are still working around Thessaloniki. Some are assigned to ballast trains around Tempi. A-206 back in the original green paint, Thessaloniki, July 2000. 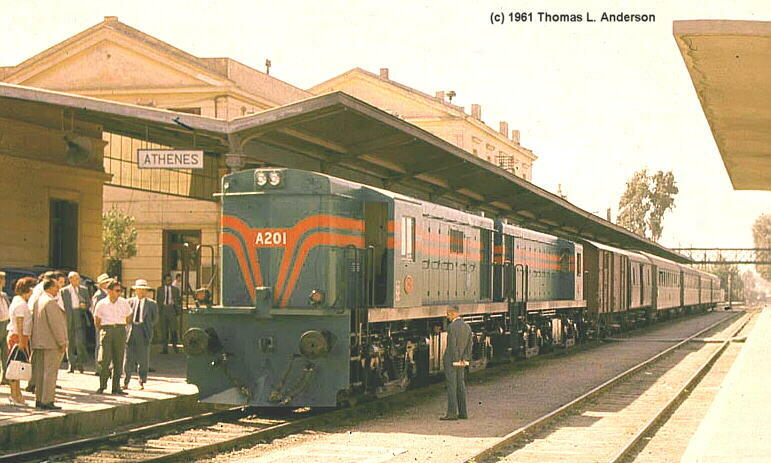 SEK A-201 and a mate waiting with a passenger train in Athens "Stathmos Larissis" in 1961. Looks like this was the inaugural train for ALCo power in Greece! A-205, its fresh coat of paint hardly dry, leaves Thessaloniki for Kozani, June 21st, 1995.